The T.H. 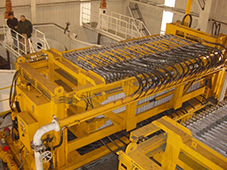 (Tecnicas Hidraulicas) fully automatic Filter Press offers a cost effective and robust solution for the demanding operating conditions found in the environmental, mining and mineral industries. With the growing demand for the elimination of slimes dams, this product will find its right-full place in this competitive market due to its low capital and operating costs. More 350 units have been installed worldwide. The design ensures durability, reliability and effectiveness with unique advantages. The Filter Press sizes range from 1.41 m² to 594 m² which is capable of producing filter cakes of up to 85 tons/hour dry solids per press. Filtration. Each vertical chamber is fed individually (from the top), which ensures all cakes are uniform in size distribution and moisture content (using the forces of gravity to its benefit). Cake pressing. Hydraulic pressing is used to homogenise the cake. 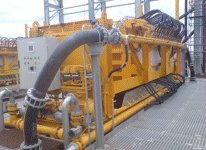 This is achieved by compressing the rubber seals between each chamber, using the hydraulic closing cylinders (340 tons). Cake washing (optional). The cakes can be washed to displace the mother liquor. A minimum amount of wash liquid is required for this step and normally does not exceed 2 m³/ton dry solids. Air drying. Air penetrates the cakes via the filtrate ports, to ensure even cake moistures throughout the cakes. Cake discharge. 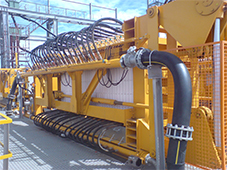 Positive, automatic cake discharge is guaranteed with every cycle. The cake can be discharged on a conveyor belt below the filter. Cloth washing (optional). The cloths are washed by means of back-washing via the filtrate ports through the drain grooves. 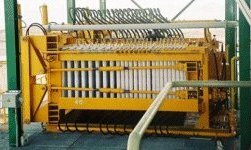 This method does not only remove solids captured in the weaves of the cloth, but also flushes the feed ports and slurry distribution pipe of the filter unit. Please Feel Free So Contact Us For Any Enquiries.